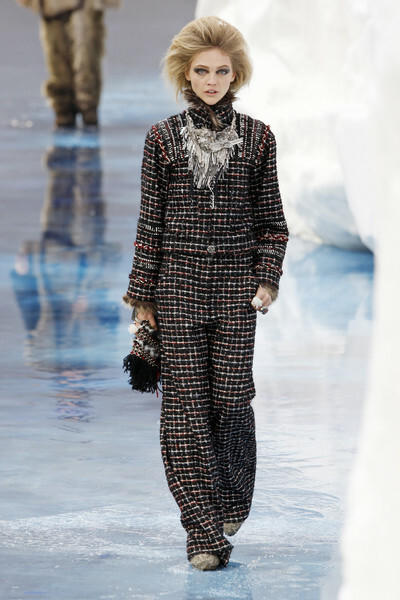 Global cooling, not global warming was the inspiration for Chanel’s fall/winter collection. Now don’t think the show was about durable fashion or had something to do with eco-friendly production. No, on the contrary Karl Lagerfeld even flew in an iceberg from Sweden to decorate his catwalk. After the fashion show that iceberg was to be flewn back to Sweden as well. If you ask us, this kind of superfluous actions only increase global warming. 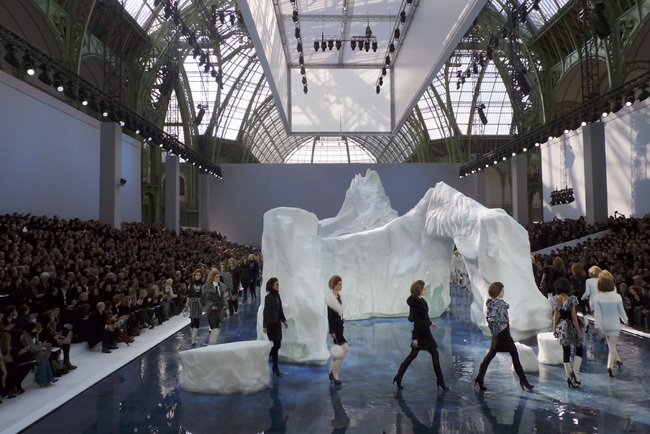 During the show the iceberg was slowly melting, so all models ended up walking in big puddles of water. What a pity for the luxurious clothes! Karl’s long pants, floor-sweeping coats & dresses and his fur boots all got wet. His fake fur boots, we must say. Cause the whole iceberg-thing might not have been so politically correct, Karl did use fake fur for this collection. He commented: ‘You cannot fake chic but you can be chic in fake fur’ and explained that fake fur, nowadays, looks very realistic. Because you can hardly see the difference between real and fake fur Karl decided this collection was to be a ‘triumph for fake fur’. The fur came in brown, gray, white and black and was seen on the skirts, boots, pants, cuffs, coats, bags and collars. Other fabrics were leather and the typical Chanel tweed. Tweed was, of course, used for some of the short jackets, but we saw it on some coats, pants and skirts too. The skirts were rather short, compared to, for example those of Marc Jacobs. They ended halfway the upper leg. The collars of almost all designs were high, as were the waisted pants. Apart from a little bit of red Karl didn’t use any colors. The show ended with the last models all wearing white designs. Even the necklaces and the large rings were white (they were metallic during the first part of the show). It all looked stunning with the real, white iceberg in the background. Yet we think an iceberg from papier-mache would have been just as nice.